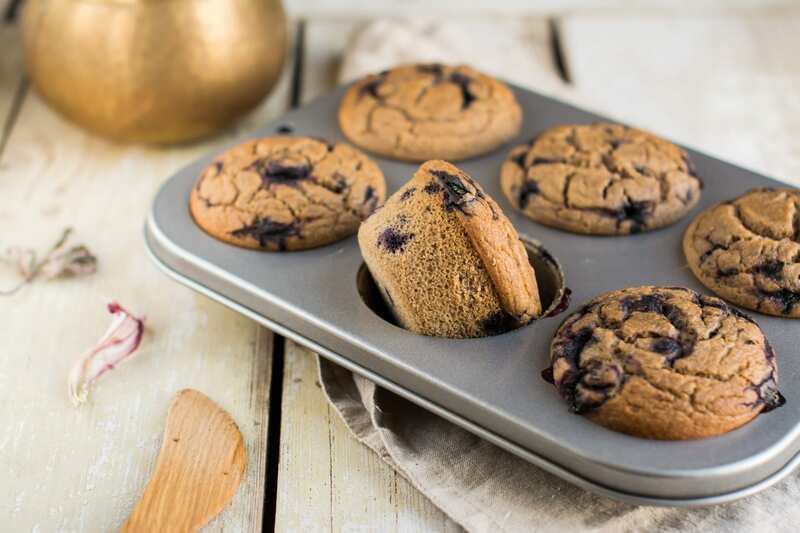 I started my soak-and-blend method for healthy muffins, nutritious and balanced porridges and guilt-free pancakes with this vegan gluten-free blueberry muffins recipe. Before that I had used the same method for fermented buckwheat bread. I love it because it allows me to get a cleaner and more digestible outcome. Remember that flours are ground up from dusty and not soaked grains. Thus, it means you’re getting a lot of phytates that inhibit mineral absorption and cause digestive ailments. It was initially my aim to create muffins that didn’t use flour. However, I also wanted them to differ from my Quick Barley Bread (Karask). Unexpectedly they turned out delightfully soft and springy like a sponge cake! And that with the first try! I just love the texture of these muffin breads so much that I even developed a proper vegan sponge cake using this recipe as a base. I find the problem with conventional bakes being the overly sweet taste. It only lets you distinguish the texture and not the flavours. 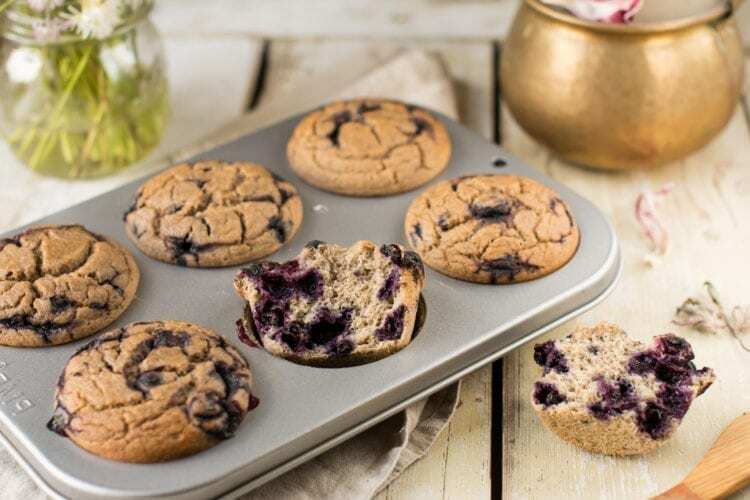 The more you chew on my blueberry muffins the sweeter they get. 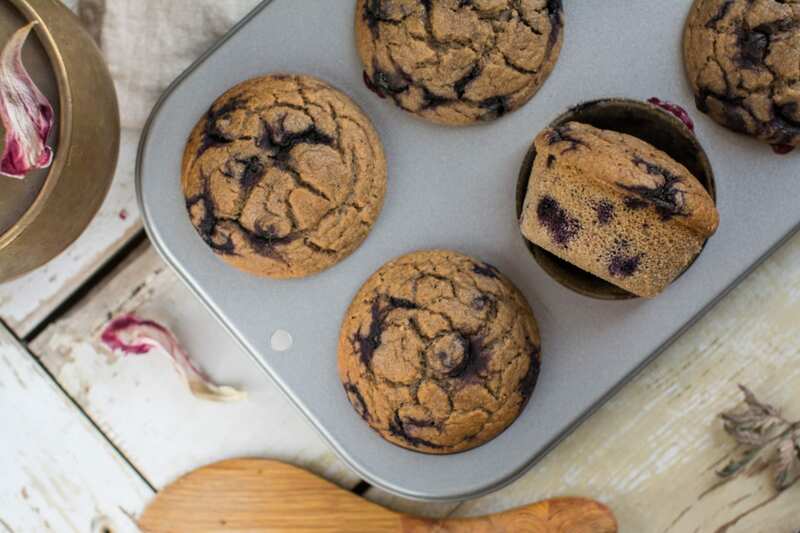 My vegan gluten-free blueberry muffins are also sugar-free and oil-free. So, totally everything-free, but so delicious and spongy! Put all ingredients except baking powder and blueberries in blender and blend until smooth batter is formed. Don’t worry; it’s supposed to be fairly liquid as millet swells quite significantly. Now, blend in baking powder. Finally mix in (DON’T BLEND) the blueberries. Divide the batter between 6-8 muffin forms and bake for 35 minutes until the muffins are golden. As I’m not on Candida cleanse any more, I can have one of those muffins without any adverse consequences. Should you still not be OK with even a small quantity of bananas, add a bit more applesauce and some xylitol or stevia for sweetness. Nutritional info per ⅙ of recipe: 223 kcal, 33.2g carbohydrates (66.3%), 5.44g fats (21.9%), 6.58g protein (11.8%), 3.79g fibres, and 15 GL (glycemic load) points. 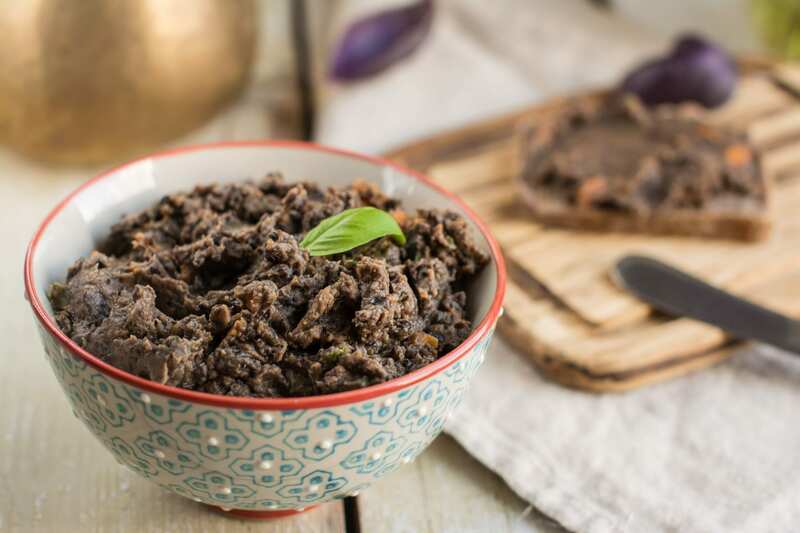 I can’t wait to try this I’m sure delicious recipe Nele! They’re so easy to make and they look so moist and spongy a real treat yet still healthy! Thank you for the recipe – I’ll be sure to update you on how my muffins turn out! Thank you Tania! I would be thrilled to hear how you liked them! These looks fantastic. I love the high protein amount from Millett. 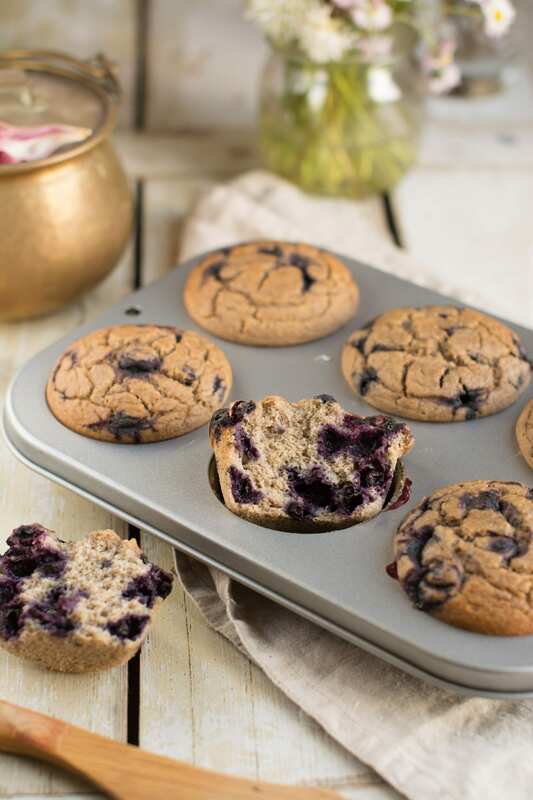 My kids love muffins and this will be a good breakfast addition to their bowl of fruit. These look so delicious I can;t wait to make them!!! I have a question about the amount of peanut butter though. 1 Heaped TBSP for me would be about 20g, but you list it as being 40g or 4oz.? None of the numbers seem to correlate with one another since 40 g would be about 3 TBSP and 4 oz. would be 112.g. From the video it looks like you are only adding about 1 TBSP but I just wanted to check to be sure. 1 level tablespoon of peanut butter is about 16 grams, so a good heaping one is about 2 level tbsps. actually, i.e. about 40 grams 🙂 And thank you for noticing, there was a mistake, which I now corrected — it should say 1.4oz. However, it’s not a rocket science — you can add more or less or even ditch the peanut butter altogether, which I have done the last couple of times and they turn out equally delicious! You know I almost had tears in my eyes when I read this 🙂 It was just so heartwarming and made me so happy! Thank you! I’m also super glad that the recipe turned out well — what a clever idea to sub banana with pureed cauliflower! Should try that sometimes! Don’t you just love the crunch and substance of millet in muffins?! I’m so glad to have you here! 🙂 About the muffins — did you rinse the groats well? If you rinsed them well and stuck to the liquid quantity in recipe, then I really can’t think of anything! Too much blueberries can make them very moist. How did they turn out exactly? I hope we can figure this out! How can we print recipe only without the zillion other pages. Most websites have a print version with recipe only. Hi! Yes, I know! We’re looking for a new recipe plug-in that would have print option as well. Sorry about that! What I do is open the recipe in my phone or tablet and place it onto kitchen counter.